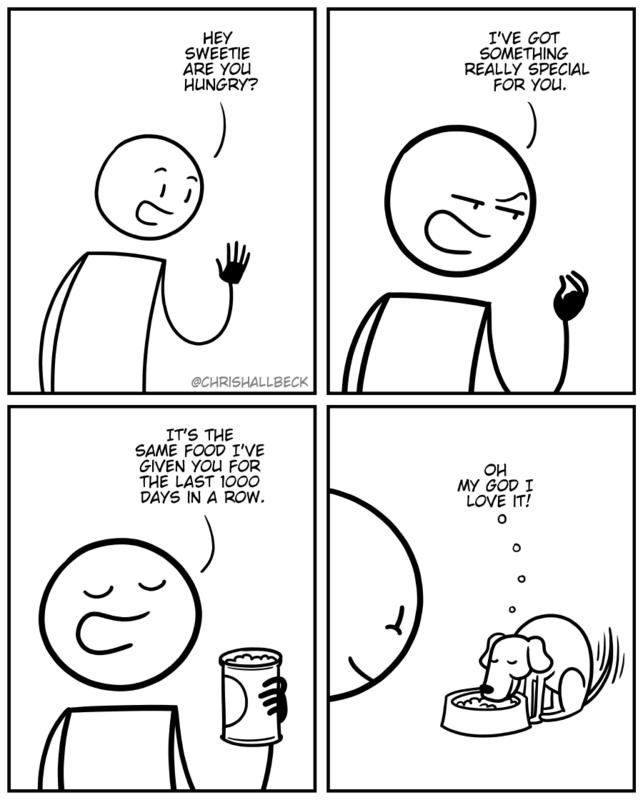 Our dog is ready to eat at the instant the food hits the bowl. It doesn’t matter what other activity was going on moments before. Food trumps all. Luckily she doesn’t read this strip or she may get some sneaky ideas. Today’s Biff reaches for the stars. Whenever I hear someone say that something tastes like dog food I always wonder if they’ve ever actually tasted dog food. Because I certainly havent! I mean who would ever be curious about that? All those tender nuggets of juicy flavor in a bowl of glistening gravy… I mean… wait. I should go make a sandwich or something. Today’s Biff takes a dip.